Transfer Balls: The BBC says Arsenal’s Chile forward Alexis Sanchez, 27, will sign a new deal at the club – if he gets a wage increase. The Daily Mirror adds that he also wants a new contract to feature a buyout clause. Why? For his ego? Those things are not worth a dime. When Arsenal offered Liverpool £40million plus £1 for Luis Suarez – so triggering his release, as per contract – Liverpool asked the Gunners ‘what they were smoking’ and refused to honour it. The Daily Mail says Sanchez and German midfielder Mesut Ozil, 27, will extend their stays at Arsenal. But is unsure what next for Jack Wilshere, 24, Alex Oxlade-Chamberlain, 23, and 26-year-old Kieran Gibbs. A home-grown player will be defined as one who, irrespective of his nationality or age, has been registered with any club affiliated to the Football Association or the Football Association of Wales for a period, continuous or not, of three entire seasons or 36 months prior to his 21st birthday (or the end of the Season during which he turns 21). Which is little odd, given that he now plays for Bournemouth, albeit on loan. Arsenal balls: A quick look at reporting on Arsenal’s Champions’ League match again PSG. The focus is on Arsenal’s new boy Shkodran Mustafi. How did he do? “…gave the ball away cheaply and put Arsenal’s midfielders under pressure. He does not look like the big-hearted leader Arsenal need at the back. Is he worth £35m? Not on this showing” – Neil Ashton, The Sun. “Mustafi was competitive and strong. Has the makings of a good signing” – John Cross, Daily Mirror. Transfer Balls: In June, the Express told readers that Spurs and England player Eric Dier was being watch. “Carlo Ancelotti eyes Tottenham swoop,” thundered the headline. News was that the new Bayern Munich manager wanted Dier. “Bayern will have to mount a fight to prise Dier away from Spurs,” continued the story. The Sunday People said the German champions are putting together a dossier on Dier. The Sun went further. “BAYERN WANT NEW BECKS,” it declared. Number of bids made for Dier over the summer: nil. Football journalism finds its nadir in the Metro, which when not writing hundreds of clickbait articles every week, is making up its Team of the Week. 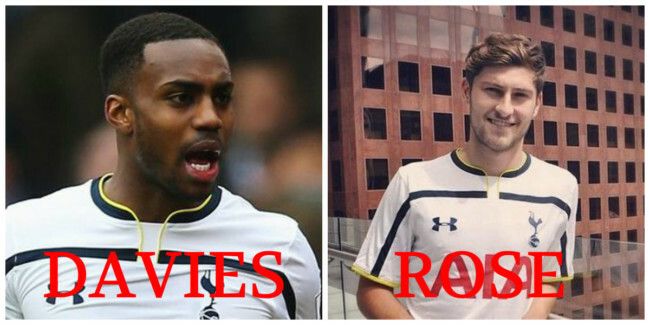 This week’s team features Tottenham’s Danny Rose. Spurs tonked Stoke last Saturday. And anyone who saw the match will have spotted Danny Rose… sat in the cheap seats nursing his injured hamstring. Tottenham are back! Or so it seems after a convincing 4-0 win over Stoke. Rose was one of the many Spurs stars to finally hit their straps after a steady start to the campaign, contributing at both ends of the pitch to ensure the north Londoners came away with all three points. Ben Davies was at left back. Is failed manager Gary Neville waiting for the Manchester United job? Former England and Manchester United defender Gary Neville is moaning. Sacked by the La Liga club Valencia in March after less than four months in charge, Neville also lost his job as England assistant manager after their dismal showing at Euro 2016. “The FA invested in me for four years. I’m the most experienced I’ve ever been yet you get chucked overboard. I’m only 41 years of age and you’re regarded as a failure and the reality of it is the investment has to come through defeat and victory. Of course, Gary, having managed unsuccessfully at Valencia, a club owned by his mate – he left with the worst win percentage of any coach in the club’s La Liga history – and been part of a management team that turned out a poor England side – England 1, Iceland 2 – Neville could step down a league or two and hone his skills at a smaller club with ambition. Or is he waiting for the United job to restore his credibility? Talking Balls: a look at media bias in football reporting. Today’s game is Swansea v Chelsea in the Premier League. The game finished 2-2, thanks to a late goal from Diego Costa. Conte’s men were dominant now – tenacious in the tackle, composed in possession and a threat going forward. Leroy Fer and Federico Fernandez were booked for cynical fouls on Diego Costa (also carded before the break for a late tackle), and Cesar Azpilicueta drew a near-post stop from Fabianski after overlapping. It was a small wonder he and Jordi Amat both stayed on the pitch having bickered throughout the game, and Costa was perhaps fortunate to escape a second yellow card for what appeared to be a dive under pressure from Swansea goalkeeper Lukasz Fabianski in the second half. If Swansea had real cause for frustration it was that Costa was still on the field to equalise. Already booked for a foul on Leroy Fer, Costa was guilty of clear simulation when contesting a ball with the Swansea goalkeeper, Lukasz Fabianski, who gestured a diving motion at an opponent also assailed by boos. Fer appeared to foul Cahill as he dispossessed the Chelsea defender, and Swansea’s Netherlands midfielder ran clear before squeezing his shot past Courtois and over the line. Leroy Fer stole possession from a dawdling Gary Cahill and bundled the ball through Thibaut Courtois legs and over the line. One Watch: a look at Manchester United manager Jose Mourinho’s branding. The Sun calls him ‘The Gifted One’. Adding that Redknapp heard the news from his cousin Frank Lampard, who player for Mourinho at Chelsea. The Sun then coins a new ‘One’. Transfer balls: how much is Atletico Madrid’s France striker Antoine Griezmann worth? The BBC says Chelsea manager Antonio Conte “wants the club to sanction a world-record bid” for Griezmann. As negotiating tactics go, telling Atletico they should expect no less than the £89.3m Manchester Untied paid for Paul Pogba – and you are willing to pay it – is not exactly canny. “Both clubs are to serve a transfer ban that prevents them from registering any players at national and international level for the next two complete and consecutive registration periods,” said a Fifa statement. The Spanish sides will now appeal to the Court of Arbitration for Sport. If that fails, will Atletico sell the France international who signed a new five-year contract with Atletico in June 2016? These bans have form. In 2014, Barcelona were banned from signing any players in 2015 after their appeal against a transfer ban was dismissed by the Court of Arbitration for Sport. Barcelona were, like Real and Atletico, found guilty of breaching Fifa’s rules on the transfer of players aged under 18. If you drag any appeal out until the next transfer window opens, look out for Atletico not selling big but buying bigger. The Manchester Evening News says Chelsea will get no clear run at splurging massive amounts of cash on one player. M.E.N. Sport understands United have earmarked Atletico Madrid goalscorer Griezmann, 25, as their primary target for the 2017 summer transfer window. Griezmann’s agent must be delighted. Bravo – deemed to be much better than England’s Joe Hart – dropping the ball to give Zlatan Ibrahimovic a well-taken goal. Bravo taking a poor touch with his fabled feet before flying into Wayne Rooney and getting away with it. It looked a clear penalty. Marouane Fellaini giving Aleksandar Kolarov a reminder of the day by knocking his tooth out. Referee Mark Clattenburg having the biggest ego on the pitch. Kevin de Bruyne playing superbly well. And then there was the “WAR” between Jose Mourinho and Pep Guardiola. That never came. The two men high-fived and hugged one another. Nothing out of the ordinary there, then. Mourinho did not rant and rave. He thought his team deserved two penalty kicks, neither of which was given. His skill is in galvanising players to want to join him in giving it all for the cause. The “aggressive” approach he takes towards winning gives fans reason to believe. 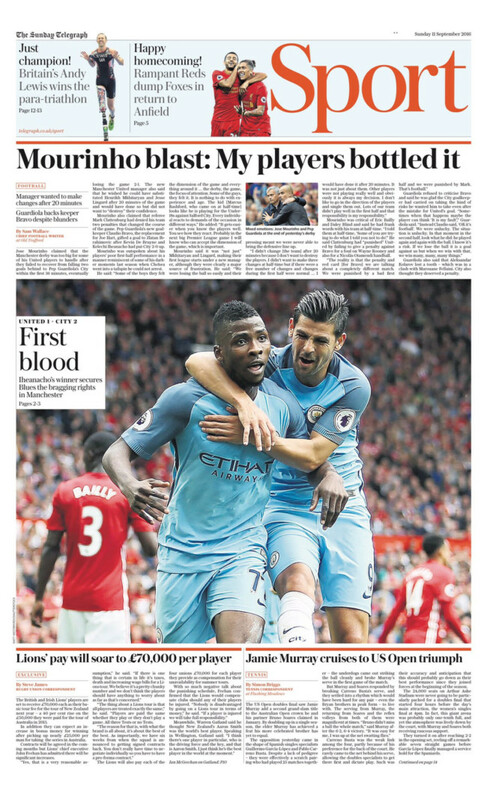 The Telegraph says Mourinho branded his players “bottlers”. 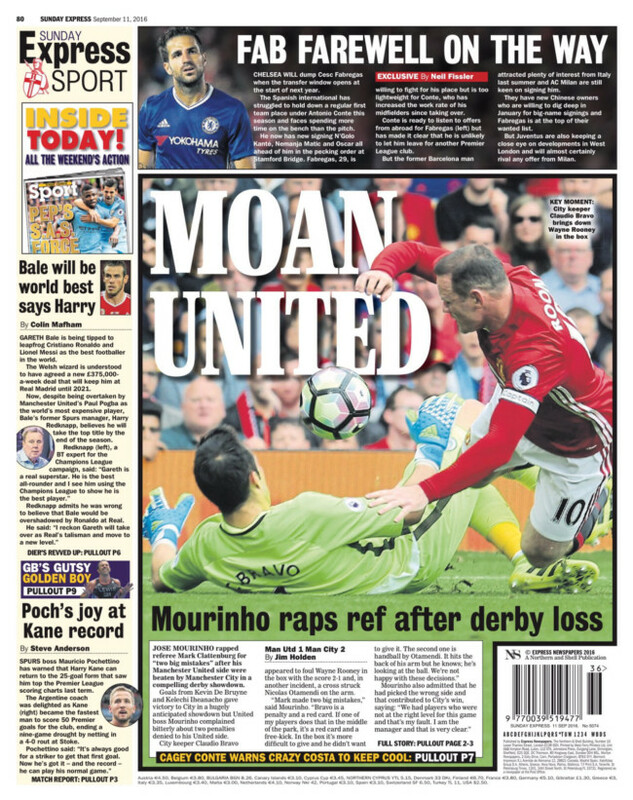 The Express says Mourinho is “moaning”. It might have said that the referee made a crucial error. Anyone who enjoys football will look forward to February 25, when these clubs are scheduled to meet again. The media has a few months to whip the match into a war. Liverpool FC tonked Leicester City 4-1 in the Reds’ first home match of the season. Looking on was Howard Webb, one of the platoon of former referees earning money as a pundit. Webb works for BTSport, where he analyses decisions to deadline. He told viewers that Jamie Vardy’s goal should not have stood. Webb says Leicester’s Shinji Okazaki broke the rules when his pressing panicked Liverpool’s Lucas into a dreadful pass across an empty area that gave Vardy an easy finish. 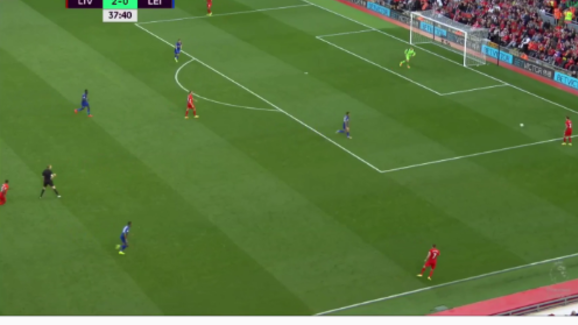 According to the absurdly picky Webb, Okazaki was illegally inside the penalty area before the ball had left it following Mignolet’s goal-kick. The ball is in play when it leaves the penalty area.. If all decisions can be reviewed by video, referees on the pitch become nothing more than remote-controlled referees. And how many of them will go on tot have a media career? Talking Balls: a look at media bias in football reporting. Today’s game is Arsenal v Southampton in the Premier League. Arsenal won 2-1, thanks to a very late penalty. But in injury-time they conceded a penalty after the slightest of tugs on Olivier Giroud’s shirt by Jose Fonte. Fonte, understandably furious as Giroud was giving as good as he got, was booked – and Santi Cazorla sent Fraser Forster the wrong way. There was definite contact between Fonte and Giroud but the decision incensed Southampton manager Claude Puel and his players, with the situation further complicated by Koscielny lying strewn in the goalmouth having taken a kick to the face moments earlier. Giroud then tangled with Fonte in the box on 90 minutes – and referee Madely awarded a penalty. And despite a delay as Koscielny was treated for an injury Cazorla then struck the winner to make it 2-1 to The Arsenal. Only the local Southampton newspaper says Giroud was “giving as good as he got”. No other newspaper – national or otherwise – mentions Giroud fouling. Olivier Giroud was hauled down by Jose Fonte and Cazorla kept his nerve to beat Fraser Forster. It’s Manchester Untied v Manchester City in the Premier League. It’s WAR! It is. The media has told us as much. 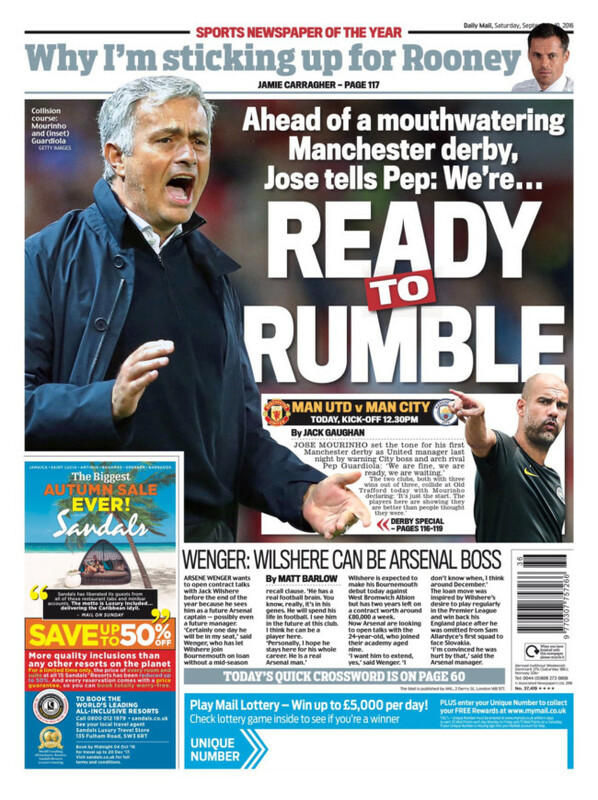 In the Mail Jose Mourinho tells Pep Guardiola “WE’RE READY TO RUMBLE”. Such was the public love-in of Mourinho and Guardiola yesterday — and the Premier League insists that no missive was launched from London demanding common courtesy — that it would be little surprise to find half-and-half scarves featuring the pair for sale outside Old Trafford. It’s PEACE before the WAR. The BBC says Real Madrid players Cristiano Ronaldo, 31, Gareth Bale, 27, midfielders Toni Kroos, 26, and Luka Modric, 30, are all on course to extend their contracts with Real Madrid. Manchester United never did sign any of them. It’s Manchester United v Manchester City. It’s the game between Pep Guardiola v Jose Mourinho, what the Guardian calls a “poisonous rivalry”. The media is awash with hype and hoopla. The game will be cagey, and very probably not all that thrilling. But to the Sun it is “WAR”. Not exactly Churchillian, eh. We will fight them on the beaches and, at the end of the day, it will be 50-50. Paul Hayward writes in the Daily Telegraph. Oliver Kay hones in on the money in The Times. It’ll be a thriller, then. Transfer balls: the BBC says Spurs and England striker Harry Kane is to be the subject of a bid from AC Milan. The Beeb says the Italians think Kane is worth 50m euros (£42.4m). Corriere dello Sport also says Kane reminds AC Milan of a young Marco Van Basten. Mourinho never did bid for Kane. As you were, England fans. “I see players in our academy and they can’t move. Our lads don’t know how to fall, roll, and you should see the amount of injuries we get from popped shoulders or their arms. I probably fell out of a tree 15 times and never hurt myself. I don’t think my son’s ever climbed a tree. “I’m a softie parent. I don’t let my kids go anywhere. My daughter’s 12, I don’t think she’d be able to cross a road. The whole life now is middle class: all kids have iPads and PlayStations. Social media’s a massive problem. We had a player who put his address on Facebook and gets a knock at the door from people asking why he’s chatting up this girlfriend. We reiterate to them every six weeks about what to do and not do on social media. Is it because these children see football mainly as a way to riches, not as a sport to play for fun? I learned so much from the responsibilities I had as an apprentice at Manchester United. I made the orange squash for the players and was anxious watching Peter Schmeichel take his first sip in case it was too weak or too strong. I had the privilege of cleaning the boots of Roy Keane and Brian McClair. I was so proud of it that I would tell all my mates. I would be pleased when the pitch was especially muddy because it meant that I could do an even better job. It meant the world to me. If I had done a good job, the first-team players would be grateful, and we would be given a bit of cash – just £10 or £20 – at Christmas, and at the end of the season. If we had not done a good job we would know about it too. The fact is that young players today do not need to do that sort of thing. When I was an apprentice at United I was paid £40 per week. When I played for the A and B teams we got a £4 win bonus and £2 if we drew. That was only 20 years ago. Teenage players at top clubs can now hope to earn £20,000 per week before they’ve even made themselves noticed in the first team. How many new young players does a club like Liverpool or Arsenal sign every season? The answer is very few. The fact is that most trainees will never make the grade. Trainees released from scholarship schemes are put into a central pool which allows other interested clubs to come in for them. And former Fulham scout Roger Skyrme believes there’s nothing wrong with lowering your standards. “Never lose faith in your ability, but do be prepared to move down a level,” Roger told BBC Sport. Your parents can take you there and keep you in a cosy bubble, but they cannot make you want it and go for it. Chelsea players Eden Hazard and Gary Cahill have “stuck the knife into former manager Jose Mourinho”, says the Express. (It’s a mere flesh wound in the Sun – a “sly dig”). 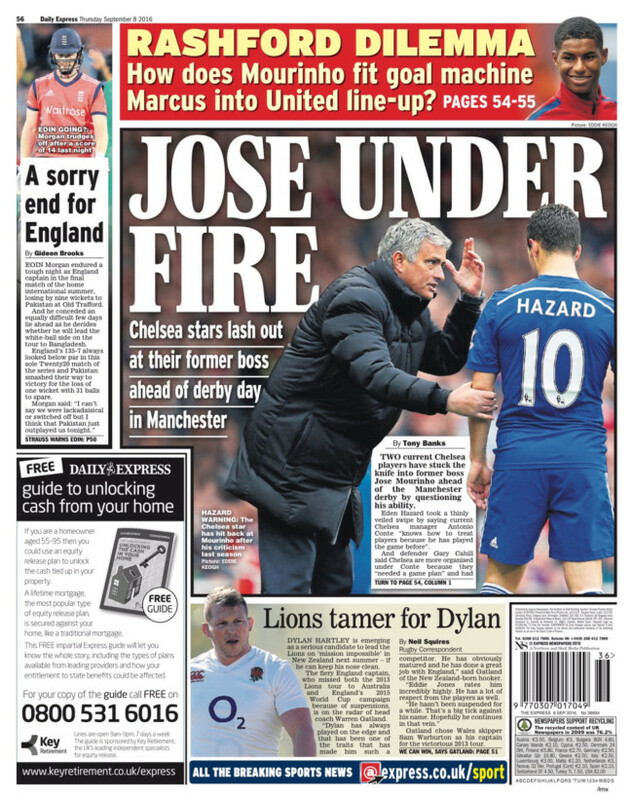 Jose is “UNDER FIRE” as Chelsea players “lash out” at their former coach, the Express continues. The quotes come. Cahill says Chelsea “lost our way tactically” under Mourinho. Not all Mourinho’s fault, then. Cahill says everyone at Chelsea played a part in last season’s failures. Although it was Mourinho who got the sack. At a coaching conference in Switzerland, Arsenal manager Arsene Wenger and Manchester United manager Jose Mourinho were both in attendance. Spanish newspaper Marca recalls the following exchange as Sir Alex Ferguson is scheduled to speak. Mourinho: Can I sit next here? And how does the Press reports on that? Mourinho reportedly wanted to sit next to Paris Saint-Germain’s Unai Emery and Real Madrid’s Zinedine Zidane for Sir Alex Ferguson’s opening speech, with Wenger close by. Next week: It’s WAR as Jose serves Arsene green jelly at his party. More news that AFC Bournemouth manager Eddie Howe is gearing up to replace Arsene Wenger at Arsenal. EDDIE HOWE is under serious consideration to become the next Arsenal manager. SunSport can reveal that the highly-regarded Bournemouth chief’s name is being discussed in the corridors of power at the Emirates. Howe inspired Bournemouth and led them to promotion to League One in 2010, only to leave for Championship side Burnley in January 2011. If Arsenal want him, he’ll surely go. 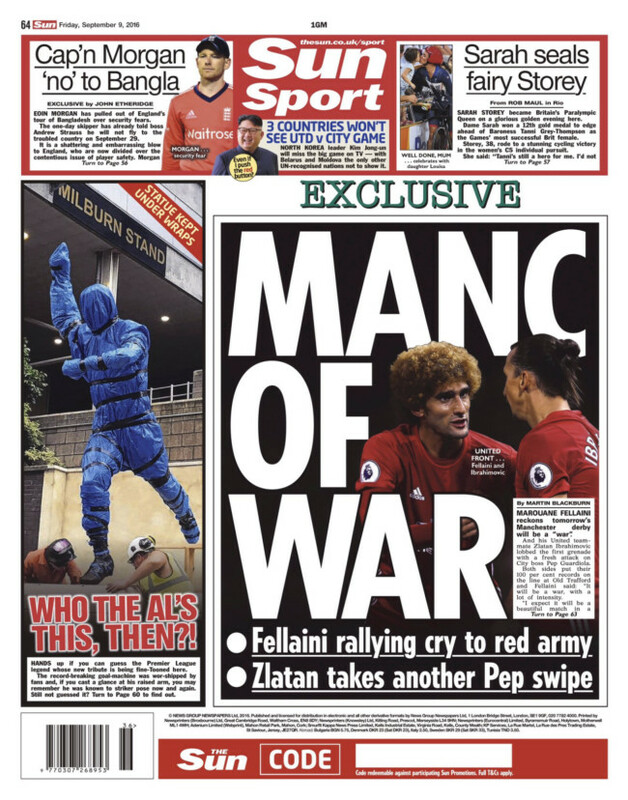 “Police fears for Jose v Pep,” screams the headline. 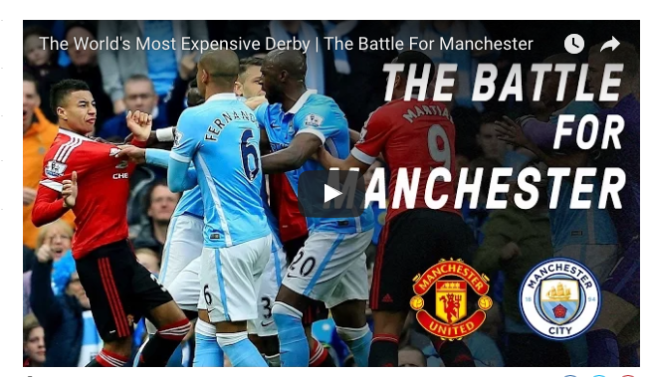 The usually harmonious Manchester derby is causing police to be scared? It’s war. We’ve had the War of Jenkin’s Ear, the War of The Stray Dog and The Pastry War. Prepare yourselves for The War of The Bitchy Comments. It’s gonna be bloody (marvellous). Dang! A player not considered good enough for Manchester City’s 21-man Champions’ League side is wanted by the club’s local rivals and Arsenal – where he’d have to take a huge pay cut to fit with their wage structure? Yaya Toure’s agent Dimitri Seluk has told Sky Sports there has been interest from Manchester United and Arsenal for the midfielder. While Seluk has insisted a move to either United or Arsenal would be “impossible”, he also revealed to Sky Sports News HQ that the midfielder has had offers from China, Turkey, Italy and the United States, and will look to sign a pre-contract agreement with another club in January. Got that? Manchester united and Arsenal want him but the mighty Toure will think about playing in Turkey. Well, so long as they don’t support Chelsea, there’s no harm done. Of course, Toure never has won the Champions’ League with Manchester City. But he might have done under Pep! The England football team laboured to a 0-1 win over the mighty Slovakia, who made the challenge simpler by reducing to ten numbers after their thuggish captain was red carded. England’s new broom, Sam Allardyce, had a few words to say about match and his own side’s captain, the tiring Wayne Rooney, nominally a striker but now playing so far back he could well challenge panicky Joe Hart for the goalkeeping slot. How’s that for management, eh? The rest of world football is quacking in its boots. At Arsenal’s star-studded ‘Legends’ match with AC Milan at the Emirates last Saturday, Nigel Winterburn and Paulo Di Canio recreated the Italians’ infamous push on ref Paul Alcock from 1998. Back then, Di Canio, then with Sheffield Wednesday, got involved in a fracas with Martin Keown before seeing red. Instead of just walking off the pitch, the Italian decided to push ref Alcock to the floor, before Winterburn himself rather lamely squared up to the striker. Di Canio earned an 11-match ban. Bingo! Having been first with the news of Paul Pogba’s transfer to Manchester United – they beat everyone, including the lawyers, the player, his agent and all clubs involved by three weeks – the Daily Mirror brings news of who United are buying next summer. Manchester United boss Jose Mourinho has already made French star Antoine Griezmann his number one target for next summer’s quest for more galactico signings. By then Mourinho will be confident of offering the much coveted Atletico Madid star Champions League football as he prepares to make another Paul Pogba style swoop. Number of facts to support this claim: zero. But there is some mind-reading because we’re told Jose Mourinho “believes the 25-year-old would be a sensation in the Premier League”. Well, if an expert thinks the top scorer at Euro 2016, the man named as the Uefa Euro 2016 player of the tournament, would be able to score in the Premier League, who are we to argue with such insight. 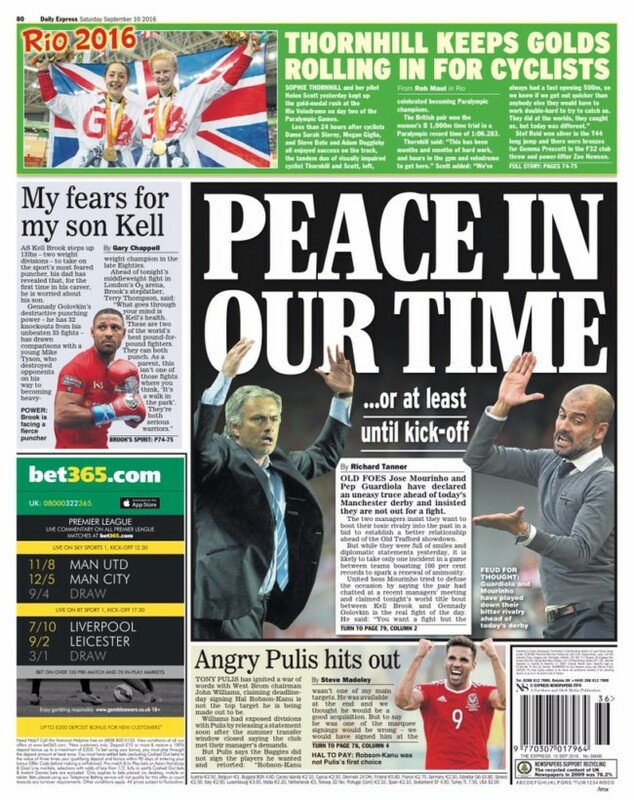 The Mirror’s conceit is, of course, that when Manchester United come knocking, no player can refuse them. But last season’s Champions League finalists Atletico Madrid only signed Griezmann on a new contract last June, the deal keeping him at the club until 2021. 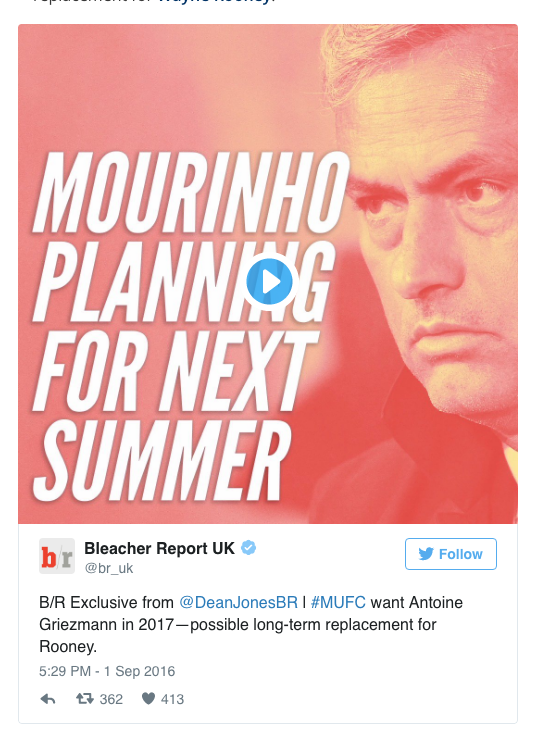 B/R Exclusive from @DeanJonesBR | #MUFC want Antoine Griezmann in 2017—possible long-term replacement for Rooney. Number of facts in that article: zero.